(Nanowerk Spotlight) Current production methods for carbon nanotubes (CNT) result in units with different diameter, length, chirality and electronic properties, all packed together in bundles, and often blended with some amount of amorphous carbon. The separation of nanotubes according to desired properties remains a technical challenge. Especially single-walled carbon nanotube (SWCNT) sorting is a challenge because the composition and chemical properties of SWCNTs of different types are very similar, making conventional separation techniques inefficient. In order to find ways to control nanotube diameter and chirality it would be necessary to monitor nanotube growth. Then, if one knew exactly how to grow nanotubes of different characteristics, one could control their electronic properties because, depending on the way the carbon atoms are arrange around the 'waist' of a nanotube, the electronic properties could vary from metallic to semiconducting. An international group of researchers has demonstrated a novel approach to use nanotubes as reaction cells, enabling them to monitor the birth and growth of carbon nanotubes, and taking some spectacular image of this process. Nucleation – the "birth" – as the first and most important step of nanotube growth, has never been accessible to observation and this initial stage of nanotube growth has remained in the realm of theoretical modeling. "Such simulations of the initial stages of CNT growth have tended to disregard bulk carbon diffusion through the body of the catalyst because the energy barrier for such diffusion is higher than for migration on a metal surface or along a metal–graphene interface" Dr. Mauricio Terrones explains to Nanowerk. "In our recent experiments not only were we able to demonstrate that bulk diffusion is indeed possible to achieve nanotube growth, we also managed to observe, for the first time, the growth process from the nucleation stage." "I guess this puts the bulk-diffusion scenario of CNT-growth into the spotlight again, with high resolution TEM experimental evidence, after a lot of theoretical work suggested carbon surface diffusion as the main CNT-growth process" adds Julio A. Rodríguez-Manzo. Terrones, who is a member of the Advanced Materials Department at IPICyT in Mexico, together with member of his group and Dr. Harold Kroto from Florida State University and Dr. Banhart from the University of Mainz, Germany, published a report on their findings in the May issue of Nature Nanotechnology ("In situ nucleation of carbon nanotubes by the injection of carbon atoms into metal particles"). Rodríguez-Manzo is first author of the paper. In their experiments, the researchers created CNTs by the injection of carbon atoms into the body of catalytically active metal nanoparticles. In particular, they used multi-walled CNTs (MWCNT) filled with metals (e.g. Fe, Co, Ni, FeCo) as reaction cells and then used a novel approach that consists in irradiating the sample with fast electrons (inside a transmission electron microscope) at 600°C. This electron beam causes carbon atoms from the CNT shells to be displaced and some of these displaced atoms could then be injected into the metal particle encapsulated in the tubes. "As more carbon atoms are injected, we noted that after some time, a nanotube (either single- or a multi-walled) started to grow from the metal particle" says Terrones. "We noted that the metal particle acts as kind of a "pasta maker" from which the injected carbon atoms are extruded in the form of a cylindrical carbon tubule. Interestingly, we noted that the metal particle is always crystalline and therefore carbon atoms diffuse through the bulk solid metal." Initially, Terrones and his colleagues wanted to study the interactions between the metal particles and carbon interstitial atoms generated from the atoms displaced from the nanotube walls. One of the scientists, Julio Rodriguez-Manzo, a PhD student, while continually observing the sample for long times (more than 90 minutes), noted that nanotubes started to grow. "This observation was only possible because Julio was patient enough to wait at the microscope, hoping that something was going to happen, and indeed something spectacular did happen" says Terrones. The observations indicate that the CNT growth mechanism is essentially the same whether the catalyst is Fe, Co, Ni or a FeCo alloy. The most compelling explanation of the results is that the carbon atoms, which serve as feedstock for further nanotube growth, appear to be ingested directly into the crystalline catalytic metallic cores from the graphitic walls of the original MWNT during electron irradiation followed by migration through the metal to the hemispherical surface regions from which the new nanotubes sprout. The experiments also demonstrated that the growing CNT is attached firmly to the metal crystal by covalent bonds. Although this new nanotube formation process differs from the chemical vapor deposition technique (CVD) commonly used for nanotube production, the fact that very similar structures result suggests that some of the detailed insights into the growth mechanism of these experiments also apply to the CVD process. Terrones points out that if they could control the diameter of the metal particle, and the source of incoming atoms into the metal particles, they could control the nanotube growth and possibly also the chirality (the way the hexagons are arranged within a tubule). More experiments need to be carried out but the results appear encouraging. 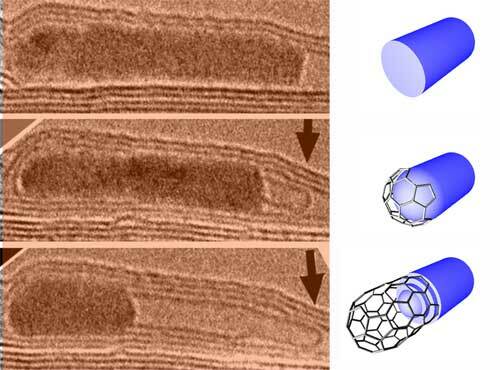 "We are now able to see, at the atomic level, how nanotubes grow" says Terrones. "If we understand clearly the CNT growth, we could then make nanotubes according to predetermined dimensions. This will be a breakthrough, and I do not doubt that chirality control of CNTs will be achieved in the near future."